Dr. J.D. Smith, associate professor of astronomy, viewed Venus last month through a commemorative eyepiece during a tour of the Discovery Channel Telescope facility in Happy Jack, Ariz.
“We are playing in the major leagues,” observed University of Toledo Trustee Joseph Zerbey during a July 21 visit to the Lowell Observatory in Flagstaff, Ariz.
Zerbey was part of a delegation of 10 UT faculty, students and administrators who headed out West to sign an agreement making the University a partner in the Discovery Channel Telescope. 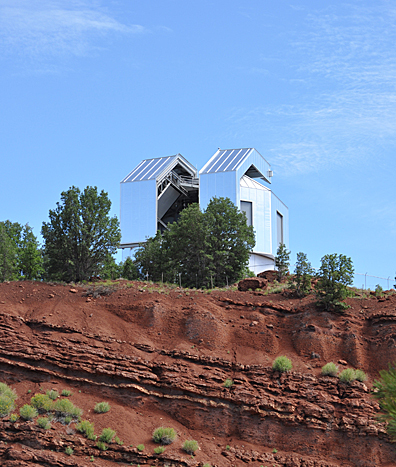 UT, Boston University and the University of Maryland have joined a consortium with the Lowell Observatory and the Discovery Channel to conduct scientific research using the 4.3-meter telescope located south of Flagstaff overlooking the Verde Valley. It is the fifth largest telescope in the continental United States and one of the most technologically advanced. 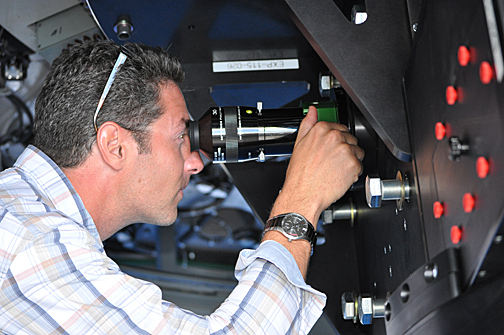 Described by Dr. Michael Cushing, assistant professor of astronomy and director of the Ritter Planetarium, as the “Swiss Army knife” of telescopes, the Discovery Channel Telescope poses tremendous opportunities for UT researchers. The 4.3-meter Discovery Channel Telescope is located south of Flagstaff in a semi-remote area that overlooks the Verde Valley near Sedona. Coupled with the recent installation of a new, state-of-the-art projector in Ritter Planetarium and ongoing research success among astronomy faculty, University leaders felt that the investment in the telescope consortium was a natural fit. “Sometimes the stars align to create a situation where you have all the elements for greatness, and I think that has happened here,” said Dr. William McMillen, provost and executive vice president for academic affairs. The Discovery Channel Telescope already has released its first images, and UT faculty hope to begin using the telescope to advance research this spring. Meanwhile, the Discovery Channel is preparing to debut a documentary about the project; “Scanning the Skies: The Discovery Channel Telescope” will air Sunday, Sept. 9, at 7 p.m. This entry was posted on Wednesday, August 22nd, 2012 at 4:32 am and is filed under News, Research, UToday .